A third of CAB clients find themselves digitally excluded, according to new research. Figures from Citizens Advice Bureaux clients shows that a majority of clients also felt unable to apply for benefits or jobs online by themselves, which has implications for those wishing to claim benefits for which they may be entitled, particularly Universal Credit. A third of clients were not proficient in using a computer and this could be related to the level of deprivation of the area they lived in. One third of clients did not access the internet or hardly ever accessed the internet which is higher than the national figure. Younger respondents were more likely to use the internet than older clients. However, digital inclusion appears to have slightly increased amongst clients overall between 2013 and 2015. More clients reported being able to use a computer and get online. Computers and smartphones were the two most common methods for accessing the internet. Most clients (72%) access the internet at home, followed by at family or friends (29%), the library (15%) or work (14%). The proportion of those saying they access the internet at the library decreased from 2013, when 45% of respondents then saying this was how they got online outside of the home. This change may be attributable to the differences in samples, but could also be indicative of ongoing budgetary pressures faced by local authorities and the impact this may be having on local library services. Those who did not access the internet also did not consider themselves proficient in using a computer. Those least proficient in using a computer were found to be least likely to say that they wanted free training or support opportunities. Those who were already proficient in using a computer were most interested in taking advantage of such opportunities. 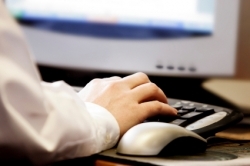 The majority of clients felt unable to apply for benefits or jobs online by themselves. The most common barriers experienced by clients were skills and confidence, practical access, health issues and online application processes. The report also makes a number of recommendations designed to help increase the uptake of the internet and computers. This research serves as an update to a survey of CAB clients carried out in 2013, the results of which are included in the report Offline and Left Behind.